Remember I told you that I hardly ever make my curry from scratch because there are many good curry pastes readily available in Malaysia? Go to any markets or stores one can find various selection of curry pastes–they usually come packaged in small plastic bags. All you have to do is adding your meat or seafood to the curry paste and you will have a pot of sinfully good–and authentic–Malaysian Indian-style curries. That being said, this seafood curry was prepared just that–from a seafood curry paste that I brought back from home. For my US readers, you might be more familiar with Thai or Indian curries offered here at Thai or Indian restaurants. Malaysian curries are quite different. 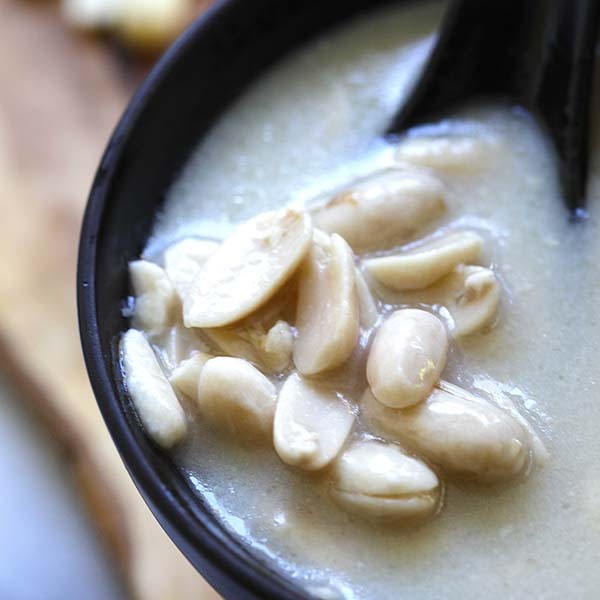 Unlike Thai curries, Malaysian curries are not sweet because coconut milk is used sparingly to complement the spices but not overshadow their tastes. Also, no sugar and fish sauce are added so you get the natural flavors of the ingredients–be it meat, chicken, fish, or other seafood. Malaysian curries are also heavier in spices and thus hotter. Compared to the Indian curries, Malaysian curries are also different because yoghurt isn’t used. The cooking style originated from the southern part of India, but had since been localized to a Malaysian taste. Anyway, everytime I go home to Penang, I am sure to bring back loads of these curry pastes. They keep well in the fridge and last a few months. If you would like to find out more about what brands I like, drop me a comment or email. 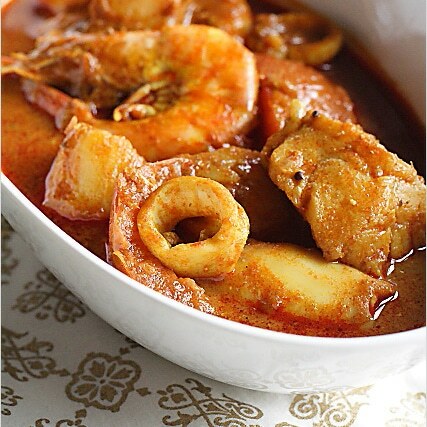 "Seafood Curry Recipe (Malaysian Indian-Style): The cooking style originated from the southern part of India, but had since been localized to a Malaysian taste. Heat up a pot and saute the shallots until aromatic. Add the curry paste into the pot and do a few quick stirs. Add 1 1/2 cups water and bring it to boil. Then add the seafood, cover the pot until cooked. Add the coconut milk and salt to taste. Serve hot. The curry looks delicious! I really like the sparing use of coconut milk. The hotter the curry, the better for my tastes! Being a big time curry lover, I am always happy to learn more about the nuances of it. Thanks for the education on Malaysian curries. Bee, we used one of those A-1 brand paste packets you gave us to make fish curry. It was very nice! The flavor was spot-on and the heat was goooood! Thanks again. im often confused with indian and malay curries due to the overload of mamaks around..neither here nor there..
Oh, this does look wonderful. I’m always happy to learn more about curry. Can you tell us which brands you like that we can find here in the U.S.? Thanks Bee! Hello!! Glad i came across ur site! 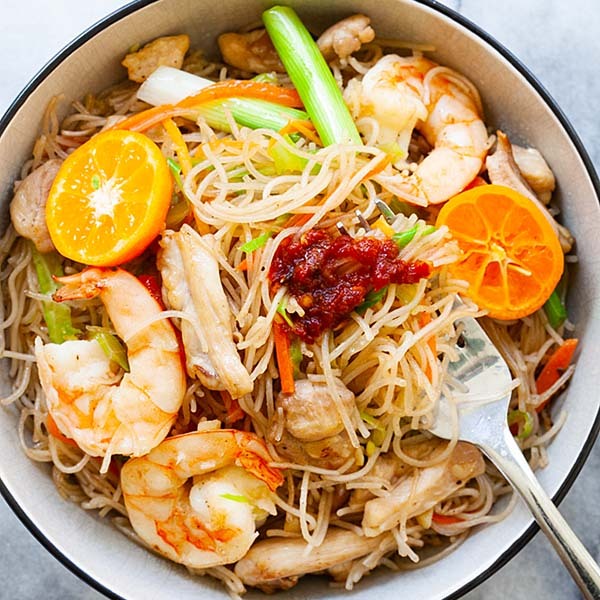 I don’t really cook Asian but I love how this looks–very deliciuos. I’ll let you know if I try it! And I’ll be back to visit! My favorite curry from Asian market are Brahim’s and Asian Home Gourmet which is from Thailand. They are yummy delicious. What type of curry paste you brought back from M’sia? Are they prepack or fresh? How to seal the fresh curry paste and fly home? I can supply the paste to you if you want, but not sure how the customs department will handle it though… Hahahah! i’m going back to penang soon – tell me what brands u bought and from where?? I was in KL a few years ago, the food was fabulous. Even the food on the plane, Malaysia Airlines, was terrific! Happy to have found your site. i would like to put this curry on my menu.what brand of the curry powder do you use?thanks. This curry looks delicious! Rasa, do you use coconut milk or coconut cream? Is there a difference between the two? This sounds so delicious! I need to make this on a night that my husband isn’t home – he is not fond of any type of curry. It’s a shame! Did you use those curry pastes that came in just a transparent plastic bag and tied with an elastic band? How did you get them through airport customs? Or were these vacuum sealed, like the Brahim ones? The dish looked deliciou indeed! Was any santan added? yum! I agree-with these sorts of curry, less (coconut milk) is more! I can see this with a bowl of steaming rice. Yes lah some red curry seafood stuff. I cant be eating spicy stuff now.. so i guess my eyes will just have to feed. 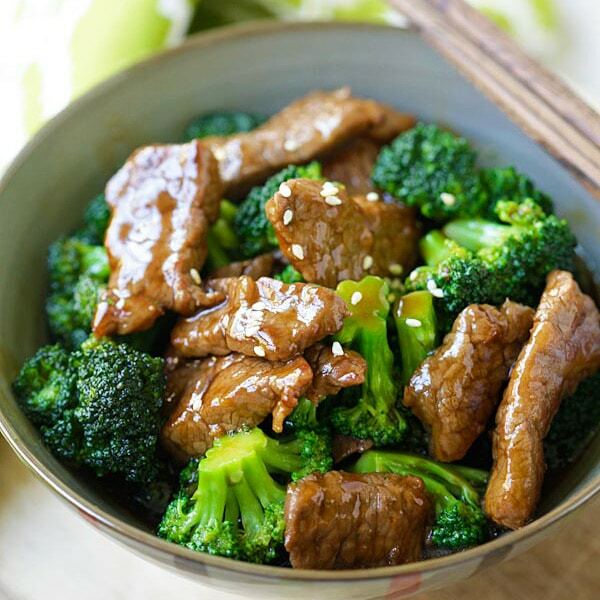 definitely a good dish to go with rice. where did you get da paste from? da curry looks sinfully good! All – this curry paste is not avaialble in the US, but if you would like to get them, send me an email. If you are in Malaysia, you can get them at markets or stores…just ask for it. 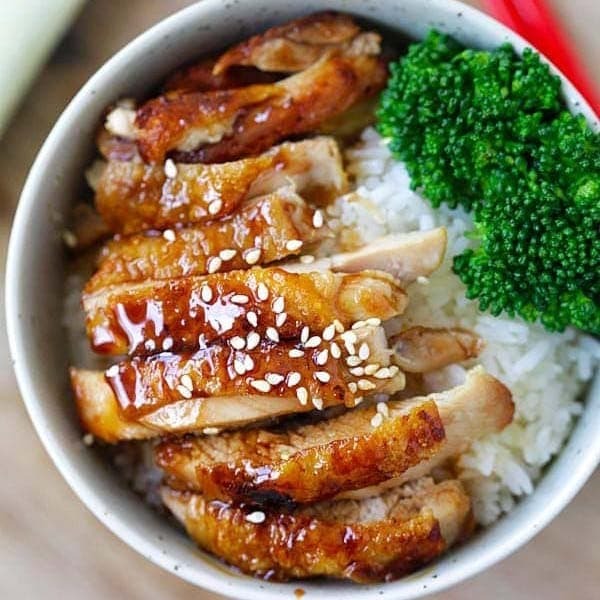 White on rice couple – I use coconut milk, but it doesn’t matter which since I used only a little. I now know how to make malaysian indian-style seafood curry thanks to your malaysian indian-style seafood curry recipe! Love ur blog. And ur fotos! u make everything look so good and yummy. if using scallops, prawns AND squid be careful when adding them as they don’t all cook at the same rate. If using fish, add fish bring to boil and turn off heat. Let it sit for 5-10 mins….purrrfect! Instead of paste I use Alagappa Meat or Fish curry powder. Just pour amount of powder you need into a bowl, add water and mix until no more lumps. Let soak for about an hour or so. You can also add chilli powder to the curry powder before adding water. Dry curry powder can keep longer and I store the balance in the fridge. Drooooooooooling!!!! Wow, this looks too delicious!! May I have the brand of your preferred curry paste from Malaysia please, thank you! yesterday i had a big fish head curry .. oh my god.. i think it’s almost as big as my head haha!! i came across your website while scanning another foodie website. must say the pictures are wonderful and pleasing to look at. they definitely make one wants to try out the recipe . i have tried many types of curry paste but one stands out. perhaps it is the same brand that Nate 2.0 mentioned above. it is A 1 Mountain Globe Brand , made by A! Best one Food Industry Sdn Bhd. of Malaysia. i have been sticking to this brand for years. there are 2 types : one for meat and the other one is for fish . so look out when you buy. if i want to get more spicy, i first fry ( low heat ) some cumin, cinnamon , chilli powder and other ( adjust the amount of each depending on your taste) before adding the paste. of course , a few pieces of fresh curry leave is almost a must to enhance the flavor. you can add onion and tomato as well . prepare the curry in the morning and leave it till evening . reheat it in the evening and it tastes much better (not to mention the leftover, if any, on the next day). Hi – I’m an avid indian cook but always trying to find new yummy things to try. Can you elaborate more on the curry pastes you have referenced. Would like to know brands and if you have found something similar here. Love the recipes and the pictures look sooooooooo good. Could you tell me what curry paste brand(s) you like to use? Preferably something I could purchase in the states since that is where I reside. I love indian/asian food, but don’t have the time to make things from scratch. you must think i’m a big dork! I added two extra posts instead of just responding back to this one. I’m good now, thanks! I just saw Nate’s post with the A-1 paste brand…Is that found in the states too..Asian food markets? We are lucky to have so many brands of instant curry paste sold in the market in Penang. I often bring some when I travel !! It is really easy and fast and a meal is ready !! “Brahim ” has many types of curry paste & Mak Nyonya brand curry ayam paste is from Penang I think, the curry is very nice. For the fish curry, add in some lady fingers or egg plant will make the curry more balance. Curry leave is a must if you cook Indian Curry and must fry them in oil otherwise the aroma will not released. Must not add in all the seafood at one time, add in those need longer time to cook first then the last one which needs lest time to cook !! Otherwise all the seafood will be hard [email protected]@~~, SO it is better not to cook mixed seafood curry. Fish curry, sotong curry or prawns curry instead!! Looks wonderful. Seafood curries are all time favourites. I am loving the way you made this curry. Wow thanks for turning me on to this! Found the curry paste at my local Super G. I used Chilliz brand seafood paste. Easy and awesome! !